Former high-school teacher Steve Cottrell is actively involved in battlefield preservation and monument projects. As a descendant of a Sixth Kansas Calvary member who served in the Indian Territory during the Civil War, he was inspired to write several books on the subject. A member of the Missouri Civil War Reenactors Association, Cottrell has participated as an extra in battle scenes for such films as the Academy Award-winning epic motion picture Glory and the Emmy Award-winning television miniseries North and South. He also participated in the action scenes for the acclaimed National Park Service film Thunder in the Ozark, which is shown to visitors at Pea Ridge National Military Park in Arkansas. 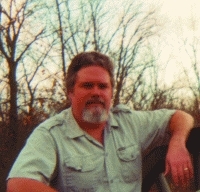 A graduate of Missouri Southern State College and Pittsburg State University, Cottrell resides in Springdale, Arkansas. Between the years of 1861 and 1865, the Civil War raged through the Ozark region, claiming the lives of both Confederate and Union soldiers along the way. While many fallen heroes have been memorialized throughout history, some lost souls were never laid to rest. Evidence of paranormal activity has been detected at such historic sites as the Kendrick House in Missouri, Prairie Grove in Arkansas, and Cabin Creek in Kansas.